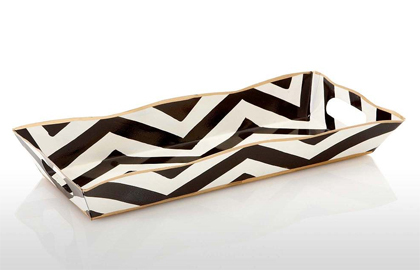 Check out the new chevron stripe vanity tray I got from One Kings Lane for $19! 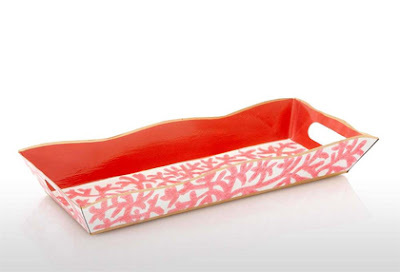 I've been wanting a tray for my desk and although this is a vanity tray, it'll be a great place to house all of my knick-knacks that are currently cluttering my desktop. I also got another one for my mom's home office (coral vanity tray), which is my next design project - I'll have more info on that for you all soon, promise! If you need an invite, just let me know! I saw them on their site. They are very pretty, and will look great on your desk! @Tote - Thank you! I've been looking for one for awhile now and I am so glad One Kings Lane finally had one at a reasonable price :) Can't wait to show you guys the office once I finally finish it.